Welcome to the desert coast of Peru. Most people think of snow and ice when they think of penguins, but our penguins are from the hot, arid coastal regions of Peru! This award-winning exhibit incorporates a rocky coast with incredible underwater viewing. It is also the first sustainable penguin exhibit with geothermal warming and cooling of water and eco-friendly water filtering systems. Watch up-close as the birds frolic just inches away. Water is an essential feature of the natural habitat of all penguins, and so it is with our Humboldt penguin exhibit. While we designed the entire exhibit to conserve natural resources, our approach to managing water use and quality is particularly innovative. We use the earth’s natural systems to ensure a pristine water environment for these endangered birds while preventing stormwater runoff from entering our lakes, thus contributing to the health of Puget Sound. The exhibit saves approximately 3,000,000 gallons of water and 22,000 kilowatt hours of energy each year! That’s the equivalent of saving 24 million pints of drinking water, and heating five, new two bedroom townhouses each year. The exhibit filters stormwater on site in two ways. First, it collects rainwater from the roof and uses it to replace pool water lost naturally through evaporation. All rainwater that falls onto the paths filters back into the ground to recharge the earth. 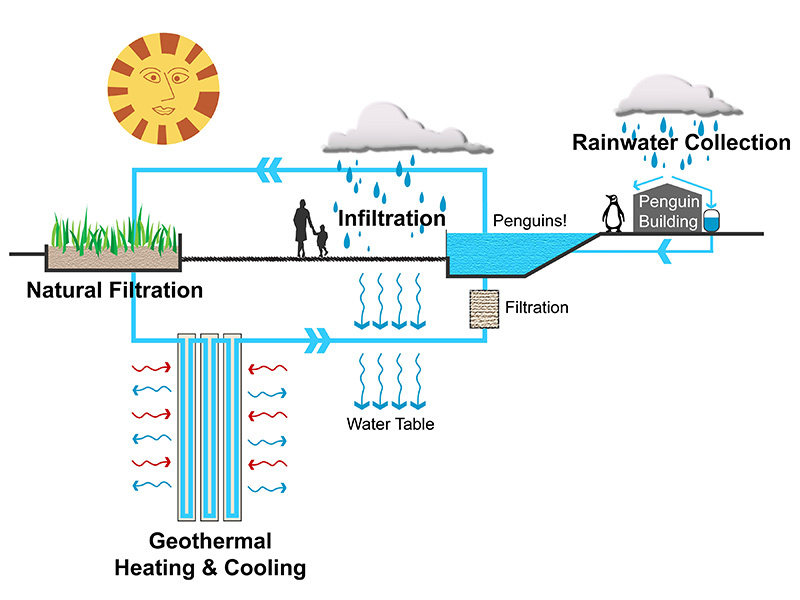 Second, “dirty” but nutrient-rich water from the penguin pool will trickle through a constructed wetland modeled on a natural filtration ecosystem. Here, plant roots and microbes will naturally absorb these nutrients, returning purified water to the penguin pool. No water enters the sewer system. The earth's own geothermal capacity heats and cools the penguin pool water. Humboldt penguins’ ideal water temperature is 50-60° F, and the earth’s temperature 100 feet below the exhibit is 55° F. Deep tubes use the earth’s thermal reserves to temper the penguin pool water appropriately, cooling it in the summer and heating it in the winter. Humboldt penguins are found along the coast of Peru and Chile in the Humboldt current. This current flows northward along the west coast of South America, bringing low salinity and nutrient-rich water from Antarctica.